guineensis (Ponera guineensis nov. 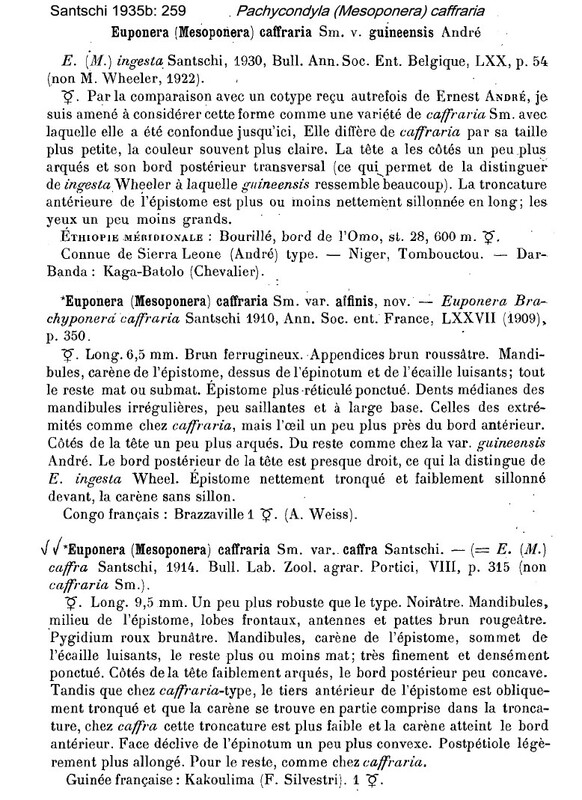 sp., André, 1890: 318, worker; synonymy of worker with the queen of caffraria by Mayr, 1895: 125, Emery, 1911d: 81; Euponera (Mesoponera) caffraria Sm. v. guineensis André, in Santschi, 1935b: 259) from Sierra Leone, collector Mocquerys - see below. 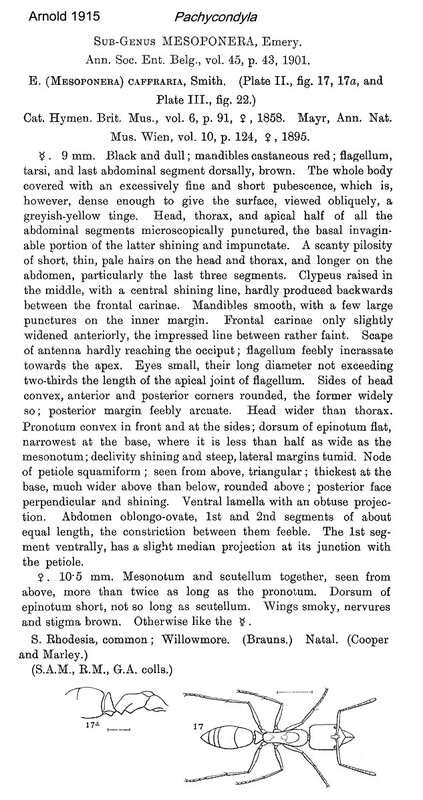 F Smith's (1858b) description is at . 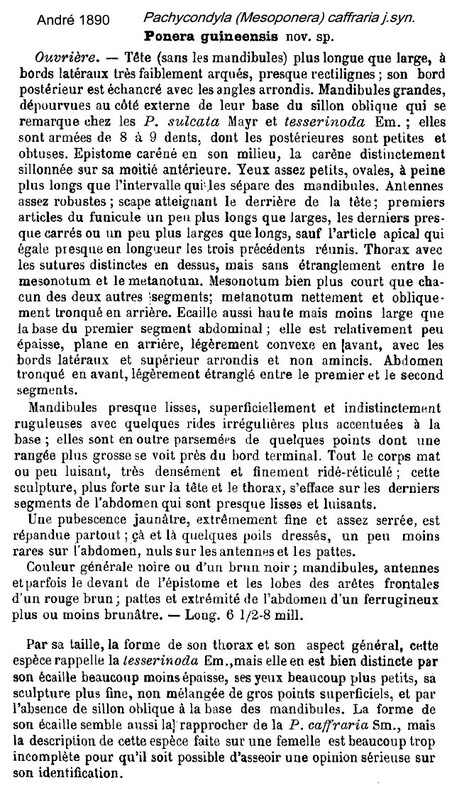 André's (1890) description of guineensis is at . 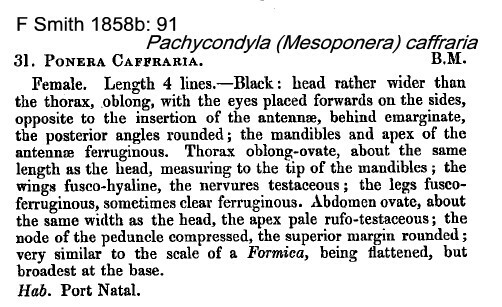 Arnold's (1915: 65) illustrated translation and description of the Euponera (Mesoponera) caffraria worker is at and the male is at . 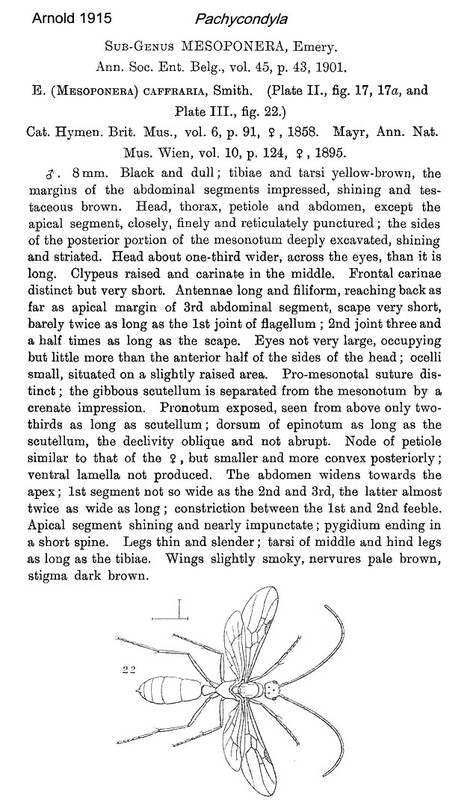 Santschi's (1935b) description of affinis and other notes is at . 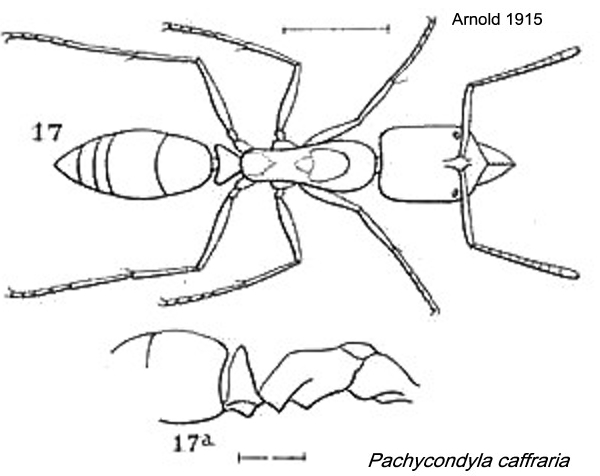 The size and features of P. caffraria worker according to Arnold are TL 9 mm, black and dull, queen TL 10.5 mm, pubescence greyish -yellow; worker scape barely reaching the occiput; anterior third of the clypeus obliquely truncate (Santcshi, 1935b). In contrast the West African-Congo Basin forms consistently have TL ca 7.0-7.5 mm and very dark brown, matt but somewhat shiny, with distinct yellowish pubescence; worker scape clearly attaining and even surpassing the occiput; anterior border f clyepus truncate and feebly bordered (sillonée). Dense pilosity but less on head. Mandibles large triangular, with more than eight teeth. Clypeus longitudinally carinate. Metanotal groove present and impressed. A distinct groove on the lateral mesonotum. Propodeum compressed above, considerably narrower in dorsal view than the pronotum, posterior face concave. Petiole a thick scale, subpetiolar process with a blunt apical tooth at the anterior corner. Colour nearly black, lighter on extremities. I collected the specimens from a nest found in a rotting log on the ground. This appears to be a close match for the description given for guineensis by André (1890, see card). Wheeler (1922) listed it also from Cameroun (at ?, H. Brauns) and widely across sub-Saharan Africa. From Guinea, Bernard (1952) reported it as having small, epigeal colonies. Findings, all savanna, were - typical form - Kéoulenta D, 500 m, 9 workers, 1 queen; Ziéla (site B A3), 7 workers, ( site F) 1 worker. Variety guineensis (smaller, with larger head, and black) Kéoulenta, 2 workers; Sérengbara, 1 worker; site Fp, 4 workers. He noted that one of the Kéoulenta workers was abnormally large (with TL 7.6, HW 1.7) but that such types were not rare in Ponerines being fecund individuals, possibly replacements for the true queens. Other sizes TL 8.5-9.5 mm, Ivory Coast specimens (Agbogba, 1984). 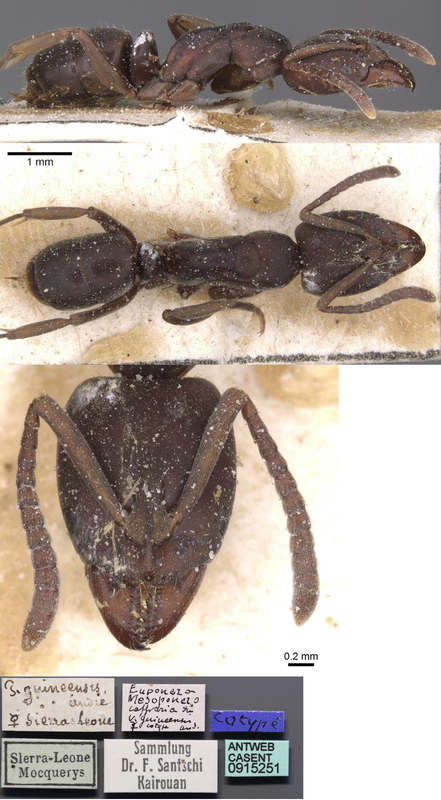 In Ghana, a single worker was collected (as Mesoponera caffraria) from the ground at CRIG by Bigger (1981a) and it was described as widespread in the semi-deciduous forest zone, from leaf litter sampling, 86 workers from 8 sites, by Belshaw & Bolton (1994b). Agbogba, who made laboratory studies of foraging with ants originally from Ivory Coast (supplied by T. Diomande and M. Lepage), found that the foragers recruit and then run in tandem. He summarised it as a soil species, foraging in and on the soil savannah, but always in well-shaded areas, and never venturing onto vegetation (Agbogba, 1984). 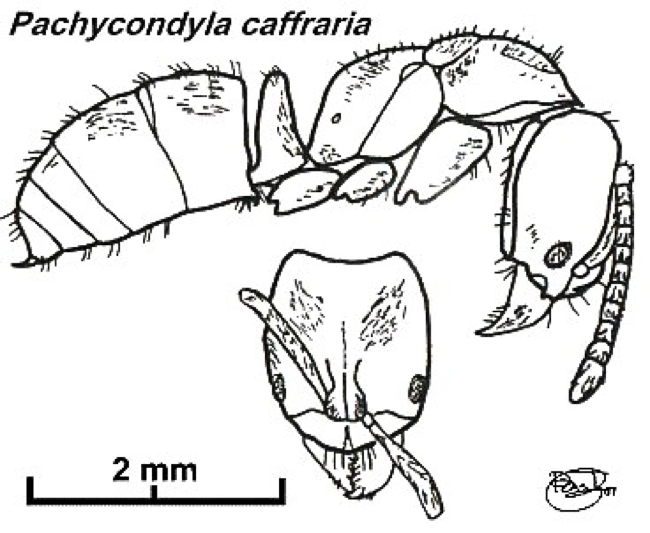 Lévieux & Diomande (1978) in their description of the activity of Pachycondyla sennaarensis, mention this species as found at Ferkéssédougou. The photomontage is of a worker from Ghana, collected by S Sky Stephens, 2005. The photomontage is of a worker from Congo, Réserve de Lésio-Louna; collector Eric Zassi (sp 04).